"Staggering sound poetry document, in deluxe boxset. "Alga Marghen presents one of the most impressive sound poetry anthologies ever published, introducing you to the sound works of the Nouveau Realiste artist, Francois Dufrene. His work, along with that of Gil J Wolman and Brion Gysin, was a strong influence for experimental poets like Henri Chopin, Bernard Heidsieck and Ake Hodell. François Dufrene could be considered the younger of the first generation sound poets. Already in the Lettrist Group when he was only 16 years old, with his own style marked by an hyper-powerful voice. In 1953, at the age of 23, he became Ultra-Lettrist, starting his first Crirhythms by overpassing the alphabet in the perspective of the physical improvised scream. With the Crirhythms sound poetry enters for the first time in the factory of projective sounds. In the beginning Dufrene uses the tape recorder only to document his creations. These recordings show him that through the tape machine his poems could reach deeper and wider creative dynamics. Since the mid-1950s, the tape-machine became for him a poetical and experimental tool and Dufrene fully develops its potentials with stereophonic recordings as well as with the superimposition of his Crirhythms. The loudspeakers amplifies sounds while the microphone captures even the most detailed concrete sound produced by his voice. The physical tempest he produces is a real concrete electronic sound attack. Dufrene produced primitive, brutal poems opening the path of vocal sounds to contemporary composers: it's known that Pierre Henry was deeply inspired by Dufrene. The anthology presented here includes 10 Crirhythms from different periods dating from 1965 to 1976. Also included is 'Osmose-Art,' a long piece from 1969 divided in two suites where Dufrene superimposes his Crirhythms to classical music. A similar technique was applied a few years earlier adding jazz music (specially drum and percussion pieces) to poems marked by strong lettristic aesthetic. Two of those 'Lecture-collage' dating from 1965 are presented here, as well as two 'Comptinuum' from his early on-progress works started in 1958. François Dufrene also developed unique performances, with a live reading of his written text. The most famous is Tombeau de Pierre Larousse, published in 1958. This is a work half way between the written text and the sound poem whose unity is achieved through Dufrene performing it. It's a masterpiece of synthesis of active poetry. 'Eryximaque, suite choreographique au Tombeau Pierre Larusse' is also included in this anthology. 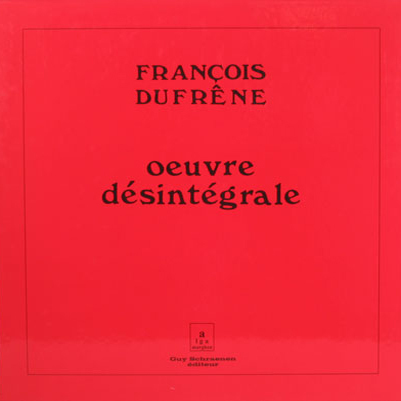 Apart from the crirythmes that Henri Chopin issued on his Revue OU disc magazine (the complete OU anthology is available from Alga Marghen as a 4CD set) and a few short pieces issued on obscure sound poetry anthologies in the end of the 1960s, François Dufrene's work is practically unavailable. This 4LP anthology, conceived by the same author and privately issued as a 3 cassette edition in the mid-1970s, includes only previously unpublished sound works that finally fully documents the creativity of such a radical artist. Deluxe heavy boxset edition limited to 345 copies."